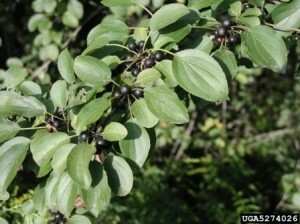 Common (European) buckthorn (Rhamnus cathartica) and smooth (glossy) buckthorn (R. frangula) are exotic shrubs that readily invade natural communities. They have long growing seasons, rapid growth rates, and re-sprout vigorously following removal of aboveground tissues. Common buckthorn is typically found in woodlands and open fields, while glossy buckthorn most commonly invades wetland communities but can also be found in upland sites such as roadsides and old fields. Plants of both species reach seed bearing age quickly but can be easily distinguished. Common buckthorn blooms May through June during leaf expansion. It produces black fruits that ripen in August through September. Glossy buckthorn blooms after leaf expansion in late May through September, and can blossom on the current season’s growth. Its fruits are initially red and turn black as they ripen in July through August. Fruits of both species are eaten by birds that can disperse them over great distances. Buckthorn seedlings can be hand pulled or removed with a digging tool, and larger plants can be pulled out with heavy equipment. Care must be taken however to minimize disturbance to soil and adjacent plants. This technique is effective in controlling buckthorns at low densities, or new infestations along trails, roads, and woodland edges. Cutting of stems at least twice in one season (June and August) can reduce plant size and stem density. However, since buckthorns will re-sprout, treatments must be repeated for 2 or 3 successive years. Regular mowing of open areas can prevent seedling establishment. Large stems can be girdled and re-sprouts clipped as they emerge. In order to be effective, parallel cuts must be made cutting through the bark slightly deeper than the cambium. Outer bark should then be removed. Buckthorn foliage remains green throughout the autumn. Mid to late fall glyphosate sprays are effective on buckthorn and reduce potential injury to non-target plants. Cut-stump treatments with glyphosate or triclopyr will help prevent re-sprouting. Also, undiluted glyphosate or triclopyr can be applied to cuts made through the bark of girdled trees. Converse, C.K. 1984. Element Stewardship Abstract for Rhamnus cathartica, Rhamnus frangula (syn. Frangula alnus), Buckthorns. The Nature Conservancy. Heidorn, R. 1991. Vegetation management guideline: Exotic Buckthorns – Common Buckthorn (Rhamnus cathartica L.), Glossy Buckthorn (Rhamnus frangula L.), Dahurian Buckthorn (Rhamnus davurica Pall.). Natural Areas Journal 11(4): 216–217.